During a quick visit to Anthropologie last week I picked up a cookbook dedicated to vanilla recipes. Of the two camps, vanilla and chocolate, I have always been loyal to the latter but lately I’ve found myself craving vanilla flavors. I believe that part of my aversion to vanilla as a child was because I probably never tasted the real thing, as in sweets using real vanilla beans or pure vanilla extract. My mother cooked wonderful meals that I loved then and still love now but she didn’t really bake, so sweet treats were often purchased. Today, vanilla desserts on the menu attract my attention almost as much as chocolate ones. 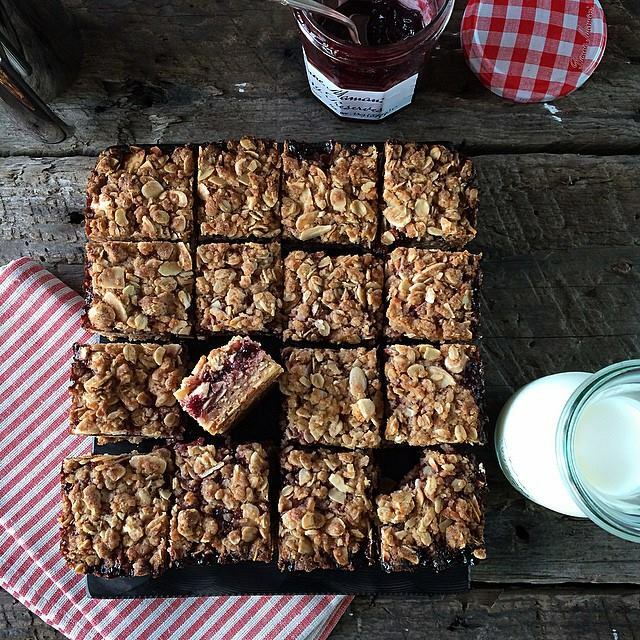 I baked these bars following the recipe exactly from the cookbook. With 1o ounces of white chocolate compared to two teaspoons combined of vanilla bean paste and vanilla extract, I was tempted to alter their name to be more reflective of the more prominent ingredient. Then it occurred to me to review the ingredient list on my Ghirardelli Classic White chips and was disappointed to discover that instead of cocoa butter, which is required for white chocolate classification, they use palm oil…but the last ingredient listed is vanilla, so the latter prevailed. The name of these bars hardly matters anyway. Unless you’re like my husband who doesn’t consider white chocolate real chocolate, the two make a nice pair, especially with the lemon curd swirled throughout. All three main components perform a nice balancing act here for a treat that any vanilla, (white) chocolate or lemon lover would enjoy. Now back to white chocolate issue. Is there a big difference in taste with the premium brands? Having always preferred dark chocolate I’ve never paid much attention to the white variety; I’ve always just used the Ghirardelli and Lindt brands. Are we missing out by not using Callebaut or Valrhona (this is our favorite for dark chocolate)? Now I’m curious to taste the difference. Vanilla and white chocolate make an ideal pair while the lemon curd balances out the sweetness of the bars. Preheat your oven to 350℉. Coat the bottom and sides of an 8x8-inch square baking pan with cooking spray and line with parchment paper so that you have overhang on two sides, about 8 by 14 inches. Melt the butter and 8 ounces of white chocolate in the microwave or using a heatproof bowl set over a pot of simmering water. Once melted, take the bowl away from the heat (if you used the stovetop method) and stir in the sugar and salt. Whisk in the eggs one at a time followed by the vanilla extract and paste. Gently fold in the flour and when you have just a little bit left of the flour still unincorporated, add the remaining 2 ounces white chocolate. Transfer the batter into the prepared pan. Distribute the lemon curd in about 5 or 6 equal portions with a spoon over the batter and swirl using a fork to partially incorporate into the batter. Bake for 25-28 minutes or until a toothpick inserted into the center comes out clean. Set the baking pan on a cooling rack and let the cake cool completely then lift the entire block out using the parchment paper and divide into small squares. This cake is better the next day. 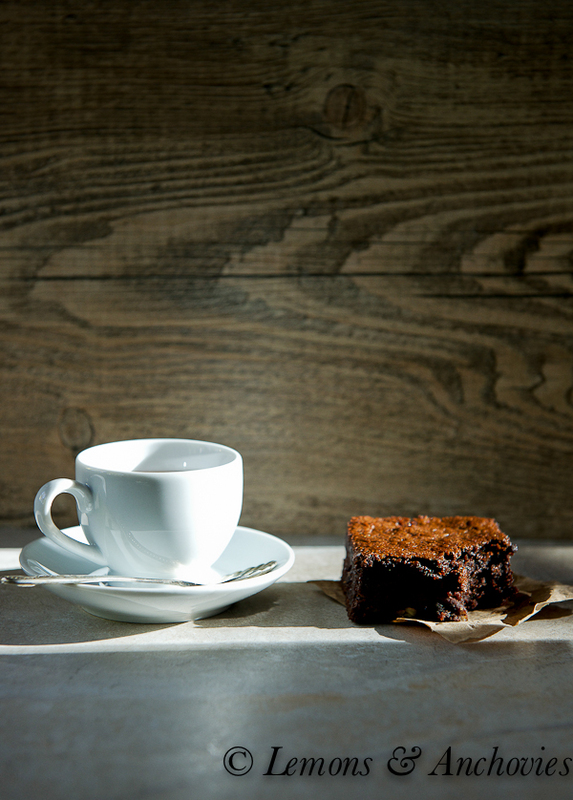 If you have time, refrigerate the cake overnight and serve it at room temperature the next day. Recipe from "Pure Vanilla: Irresistible Recipes and Essential Techniques" by Shauna Sever. 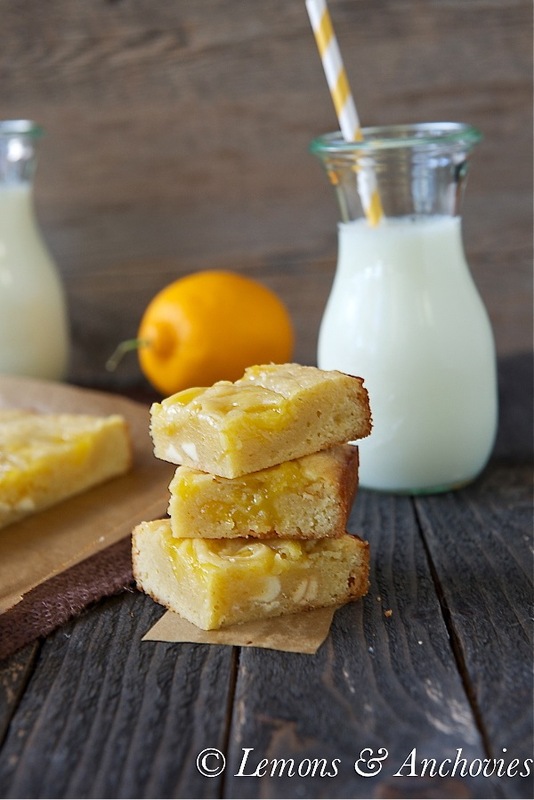 Recipe in book is called "Lemon Vanilla Dream Bars". OMG…these look incredible!!! This is exactly the first recipe I would have chosen from the “Pure Vanilla” cookbook too, Jean! Beautiful…the bars and your photos! Enjoy the remainder of your Sunday! As a lemon and white chocolate lover this makes my knees go weak! Gorgeous photos too Jean! I absolutely love that lemon curd swirl, beautiful bars! The minute I saw those bars pop up in my feed, I think my heart skipped a beat. And this coming from an admitted chocoholic! These are ridiculously gorgeous. Definitely a must try for me – what a great find at Anthro! Amazing! I’m a huge white chocolate fan so these bars are just screaming my name (at midnight of course!). I’ve been experimenting with caramelized white chocolate recently and it’s made me look very carefully at the ingredients! 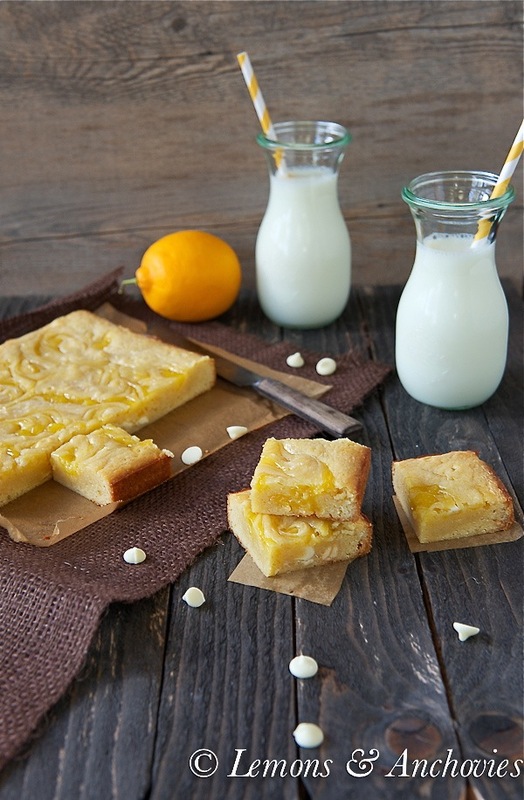 These little lemon bars look divine – sweet and sharp and a great way to welcome in the Spring. 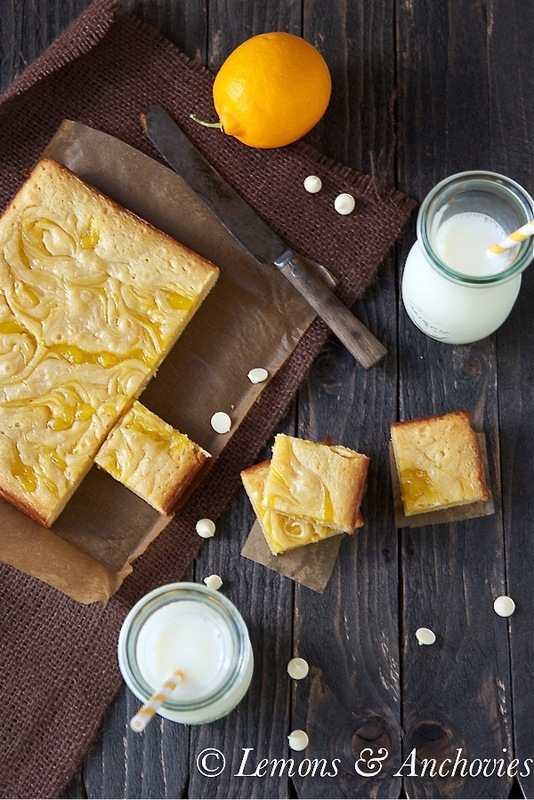 This is a nice twist on a lemon bar. My husband feels the same as yours about white chocolate. While I prefer dark I do eat the white occasionally. I find the white so so sweet and for whatever reason some varieties make me cough. I haven’t quite figured that one out yet although I’m not concerned. I would venture to say though that what separates one from another is quality of ingredients. Although a taste test could be fun! Jean, I am already in love with these bars (and the cookbook!). 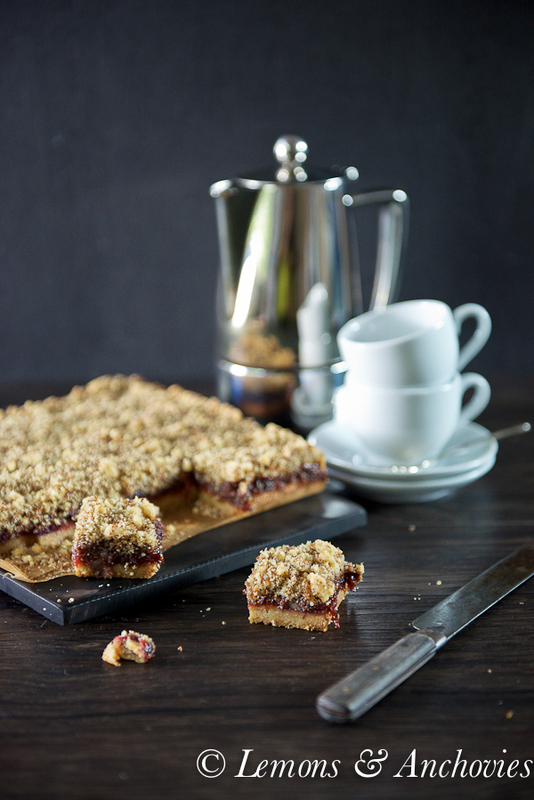 Marvelous bars and lovely swirls! A mouthwatering treat. I love your swirls, I might have to work on mine, they don’t look that good. I’m not a huge fine of white chocolate probably because I think the chips are too sweet, but I do love the bit of texture they add. So it’s a trade-off I guess. Let us know if you find some really good ones, or just let me know if you need a taste tester. Hope you had a great weekend. Ooooohhhh – these look SO yummy! I love lemon desserts so much and these are quite pretty, too! These are one of the most beautiful swirled bars I’ve seen. I don’t care much for white chocolate, prefer the dark one, but when I’m in the mood for some I choose Perugina. For baking with white chocolate I use Ghirardelli and had some good experience with Baker’s as well. I too love Anthropologie. This vanilla cookbook sounds great. I love all of the lemon recipes and this one is a true winner. Beautiful photos!!! 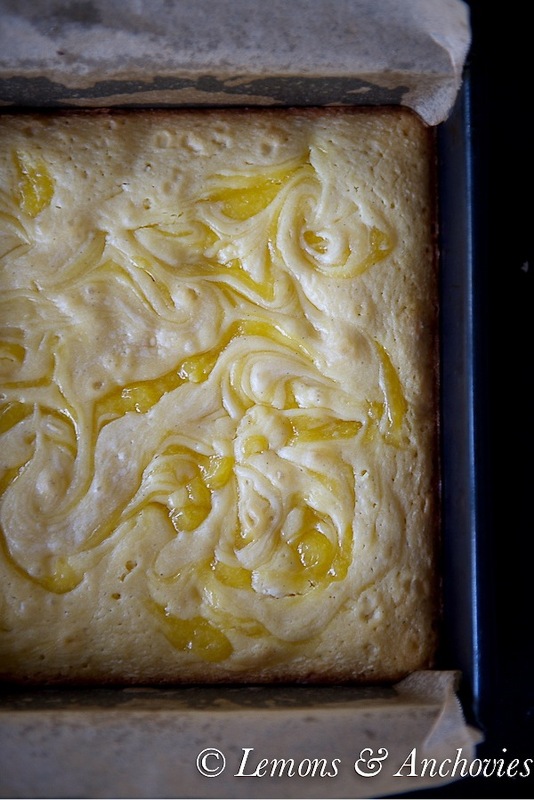 These are certainly the prettiest lemon bars I’ve ever seen, I LOVE the swirl effect. They sound amazing too. I’ve noticed that many recipes that call for lemon omit the vanilla but I always add it back it as I think they enhance each other. Wow! These look delicious. My mom doesn’t consider white chocolate “real” chocolate either. Psht, it tastes delicious. I’ve been curious to see Shauna’s new book. I do adore the flavor of vanilla. Your bars are so pretty, Jean. That mesmerizing yellow swirl reminds me of spring. I can’t wait to try these out. I never had those brands versions of white chocolate…now I’m wondering. Oh I would be hard pressed to chose between vanilla and chocolate. I go for chocolate when I want rich and vanilla when I want delicate and nuanced. So jealous of all you CA people and your citrus! These bars look heavenly, I love using pure vanilla or vanilla beans; such amazing flavor! Your food scape is so cheery and Spring-like! I can’t wait for the snow to melt here in Toronto; for the sun to break through gray skies; for the days to be longer and warmer! These swirly lemon bar is the 1000 IU of sunshine vitamin that I need to make me smile! I want to bite into my computer screen. No, seriously. These look absolutely amazing. I love the combination of white chocolate & lemon! Oh wow. These are beautiful! And lemon and white chocolate is an amazing combination. I love everything about this post! Hi, Jean! This is my first time here and I am already in love with your blog. It is filled with many delicious recipes. This one is my favorite! I cannot stop looking at the pictures. These vanilla lemon bars are the bomb!!!!!!!! I was hooked. I have been using white chocolate to make Creme Brule`. It’s wonderful. This is even better. I used Martha Stewart’s Lemon Curd recipe, too cheap to go buy a jar. so since I gave up desserts for lent I can only eat this on Sunday. The rest of my dish is waiting for me in the refrigerator. Happy Sunday, Feast Day!!! And I plan to make your Almond Butter. Keep up the good work. PS: I used Baker’s brand of White Chocolate. The box has 6 oz. I used that instead of 10 oz. and I used a full cup of my homemade lemon curd. Was heaven. THERE IS A COOKBOOK!!??!! Where do you order one? ?